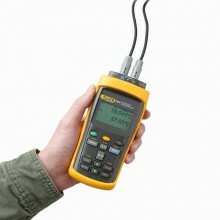 Includes: NVLAP-accredited report of calibration, Fluke 1551A-9 User’s Guide on CD-ROM, 3 AAA batteries. Please Note: Model number appended with a -9, -12, -20 indicates probe sheath length in inches. All probe diameters are 6.35 mm with the exception of the 1551A-9, which is 4.8 mm diameter. Finally, a digital substitute for your mercury-in-glass thermometers! 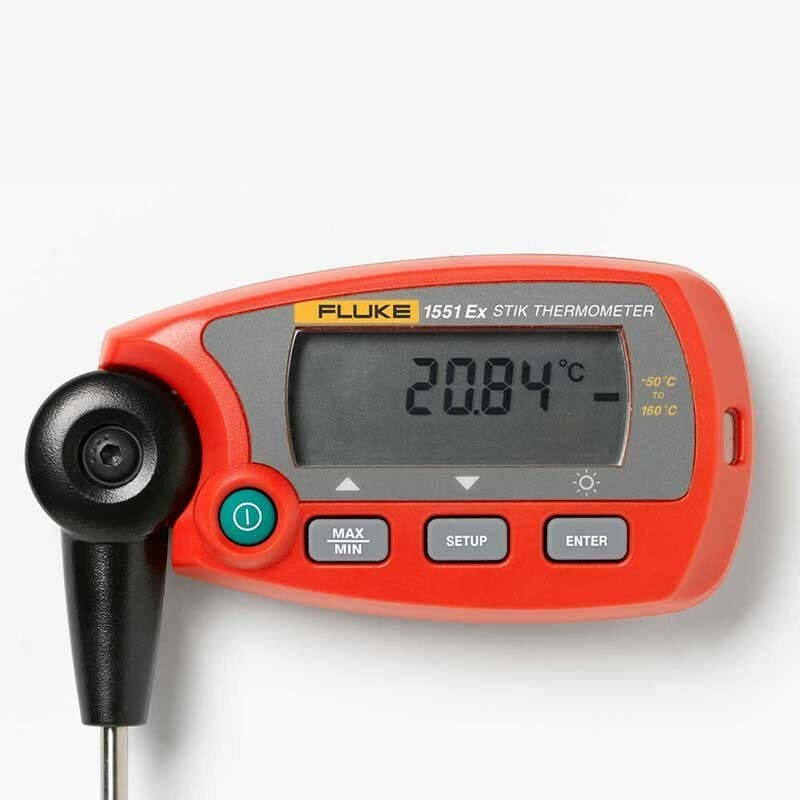 Accurate and repeatable to ± 0.05 °C over its full range, the Fluke 1551A 'Stik' Thermometer is the new 'gold standard' of industrial temperature calibration. 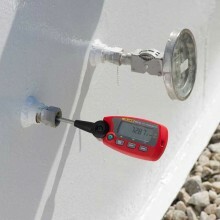 Whether working outdoors in environments where potentially explosive gases may be present or on the floor of a processing plant, the intrinsically-safe, battery operated, portable reference thermometer is designed to go where you work. 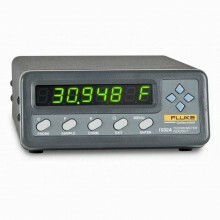 The large backlit LCD display on the Fluke 1551A Ex rotates 90° degrees making it easy to read from any angle. A user-configurable stability/trend indicator lets you know when your temperature is stable enough to record an accurate measurement. A user-settable auto-off function extends typical battery life to three hundred hours. 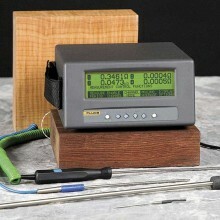 A low-battery indicator and stop-measure function prevent erroneous measurements from being made due to low battery life. 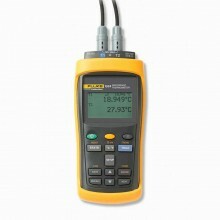 The sensor of the Fluke 1551A Ex requires a minimum immersion depth of only seven centimeters (2.8 inches), with no appreciable effect on the measured temperature due to heat loss through stem conduction. Accuracy of ± 0.05 °C (± 0.09 °F) over full range. 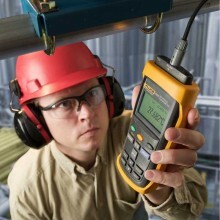 Intrinsically safe (ATEX and IECEx compliant). Two models to choose from (-50 °C to 160 °C or -80 °C to 300 °C). 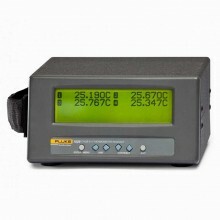 Display temperature in °C or °F. Optional data logging to internal memory. Percent battery-life and low-battery indicator. 1. 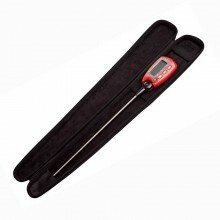 Since the “Stik” Thermometer does not contain mercury, it is not subject to government-imposed bans. Government agencies worldwide have either banned or are seeking to ban the use and transportation of industrial mercury thermometers. 2. 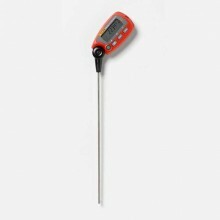 The stainless steel probe sheath of the “Stik” Thermometer is far more robust than the glass stem of a mercury thermometer and better suited for industrial environments. 3. When considering cost of ownership, a digital thermometer is less expensive than a mercury thermometer. With a mercury thermometer, you either invest in equipment or you hire out to clean up after a mercury spill. 4. 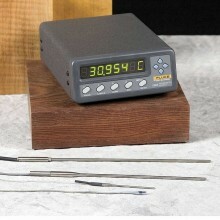 Mercury thermometers cannot be adjusted after calibration. The actual temperature must be calculated by applying corrections to the measured temperature. 5. 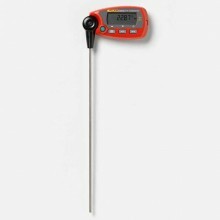 A digital thermometer doesn’t require that you match calibration conditions to achieve an accurate measurement. You’re only required to meet the minimum immersion requirements - which is only 7 cm (2.8 in) in the case of the 1551A Ex. Temperature Range -50 °C to 160 °C (-58 °F to 320 °F). Accuracy (1 year) ± 0.05 °C (± 0.09 °F). Sensor type 100 Ω thin-film RTD. Probe temperature coefficient 0.00385 Ω/Ω/°C nominal. Sensor length ≤ 10 mm. Sensor position (from sheath tip) 3 mm (0.1 in). Minimum immersion depth 7 cm (2.8 in). Probe sheath material Stainless steel. 6.35 mm diameter probe (1/4 in): 21 seconds. Probe hysteresis ± 0.01 °C. Temperature resolution Selectable: 0.1, 0.01, 0.001 (default 0.01). Sample rate Selectable: 0.5 seconds, 1 seconds, 2 seconds (default 1 seconds). Operating temperature range readout -10 °C to 50 °C (14 °F to 122 °F). Storage temperature -20 °C to 60 °C (-4 °F to 140 °F) 0 % to 95 % RH, non-condensing. Damping Moving average of the most recent 2 to 10 readings (ON/OFF, 2, 5, 10). Communications RS-232 stereo jack (access calibration parameters only). DC Power 3-AAA Batteries, typical battery life of 300 hours without LCD backlight. EMC compliance EN61326:2006 Annex C; CISPR II Edition 5.0-2009; Class “B. Electronics dimensions (H x W x D) 114 mm x 57 mm x 25 mm (4.5 in x 2.25 in x 1.0 in). Weight 196 g (6.9 oz). PDF Specifications of the Fluke 1551A/1552A 'Stik' Thermometer.